Ornithogenic soils (N = 97) dated up to 7000 Before Present (bp) were sampled in 16 relict and modern breeding colonies of Adélie penguin along the Victoria Land coast (Ross Sea, Antarctica). Taxonomic identification of fish otoliths (N = 677) recovered in these soils allowed to identify the Antarctic silverfish as the most eaten prey (90.1%) throughout the investigated period. A morphometric analysis of the otoliths revealed that the Adélie penguin primarily selected prey averaging 67.23 ± 23 mm of standard length. Temporal distribution of Pleuragramma antarcticum showed a peak between 2,000 and 4,000 years bp, a period corresponding to the maximum spread of Adélie penguin in the Victoria Land. 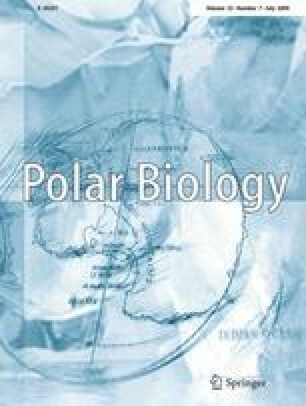 Possible explanations of the variations of the abundance of the fish prey in the diet are discussed in the context of the paleoclimatic events and as possible consequences of dietary shifts due to the temporal variation of prey availability in the Ross Sea ecosystem. This work was executed within the framework of the Italian National Program on Antarctic Research (PNRA) and was financially supported by joint research programs in geology at the University of Pisa. The authors thank Fabrizio Ciampolini (University of Siena) for scanning electron micrographs, Silvano Focardi head of the laboratories at the Department of Environmental Science (University of Siena) where the morphometric analyses were performed. David Lambert, Grant Ballard and one anonymous referee greatly improved an earlier version of the manuscript.